Move the shift gear to the R (Reverse) position or the sports mode while depressing the brake pedal. The engine will start and the green AUTO STOP indicator ( ) on the instrument cluster will go out. - When a certain amount of time has passed with the climate control system on. - When the front defroster is on. - The brake vaccum pressure is low. - The battery charging status is low. - The vehicle speed exceeds 1 MPH (1 km/h). - The fan speed is in the highest position when the air conditioning is on. - Engine is turned off by Auto Stop for a long time. - If you unfasten the seat belt or open the driver's door while depressing the brake pedal. The green AUTO STOP indicator ( ) on the instrument cluster will blink for 5 seconds and a message “Auto Start” will appear on the LCD display (if equipped). If the ISG system does not meet the operation condition, the ISG system is deactivated. 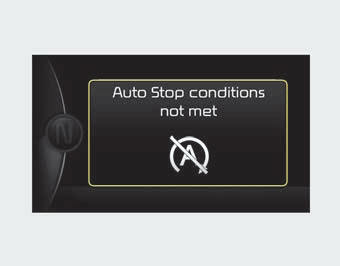 The light on the ISG OFF button will illuminate and a message “Auto Stop Conditions not met” will appear on the LCD display (if equipped).